OCEANSIDE — This year’s city Easter egg hunt will be held at Mance Buchanon Park. The new location provides more parking for the hundreds of families who attend the annual egg hunt. Keeping with tradition, egg zones for different age groups will be set up in the middle of the park. Hunt areas will be marked for age groups 3 and 4, 5 and 6, 7 and 8 and 9 through 11. At the sound of the fire engine siren all egg hunts begin. City staff says it only takes 10 minutes for every egg to be found. Hidden within each hunt area is a winning egg with a ticket for a prize basket. Finders of a “golden egg” can pick up their prizes at the event information booth. Prize baskets for lucky winners include a ball, craft items, small toys and candy. For the 9- to 11-year-old age group there is also a big chocolate bunny. The other 600 eggs will have treats inside. “There will be plenty of eggs and candy,” Jesse Montanez, city recreation supervisor, said. To make sure no one goes home empty-handed, city staff will have extra treats for late arrivals and kids who do not find an egg. The emphasis is on fun and community building. The Easter Bunny will be roaming the park grounds before the egg hunt, and is available for photos afterward. A magic show will be held in the central food service area following the hunt. Hot dogs, baked good and carnival toys will be available for purchase. “It’s a great day to hang out in the park,” Montanez said. The egg hunt at Mance Buchanon Park is the only city-sponsored egg hunt. There are also neighborhood egg hunts organized by community groups and churches. No egg hunt will be held at Buddy Todd Park, which was the site of the city egg hunt for the past six years. The Easter egg hunt begins promptly at 10 a.m. April 15, at Mance Buchanon Park, 425 College Blvd. Families are encouraged to arrive 30 minutes early. Kids need to bring their own basket or bag to hold eggs. The event is free. 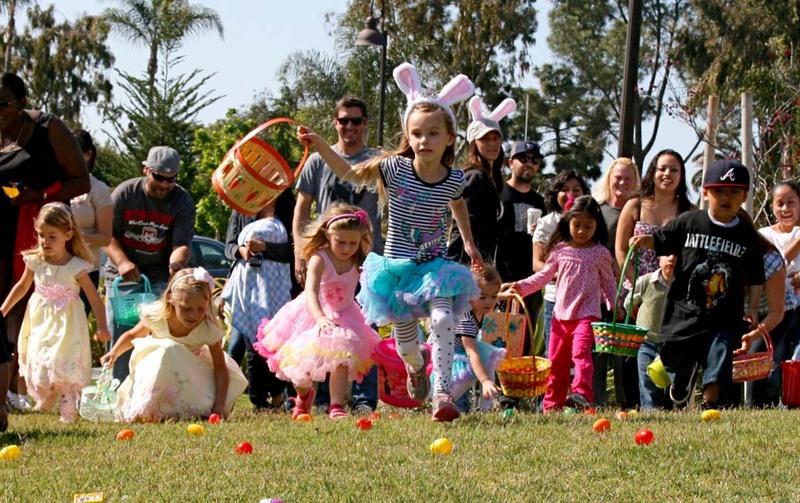 The Oceanside Public Library is also hosting three egg hunts for kids age 7 and younger. The library egg hunts include springtime stories, songs, crafts and eggs hidden among books. The annual tradition is a big hit with young readers. The Mission Branch Library will hold an English story time and egg hunt at 10:30 a.m., and Spanish story time and egg hunt at 11:30 a.m. April 7. Events will take place in the library community room at 3861-B Mission Ave. The Civic Center Library egg hunt and story time in English begins at 10:30 a.m. April 11. The event will be in the community room at 330 North Coast Highway.